Meanwhile, cook bacon in large skillet over medium heat until crisp. Remove bacon from skillet; drain on paper towels. Reserve 1 tablespoon drippings in skillet. Add onion; cook until tender. Split warm biscuits. 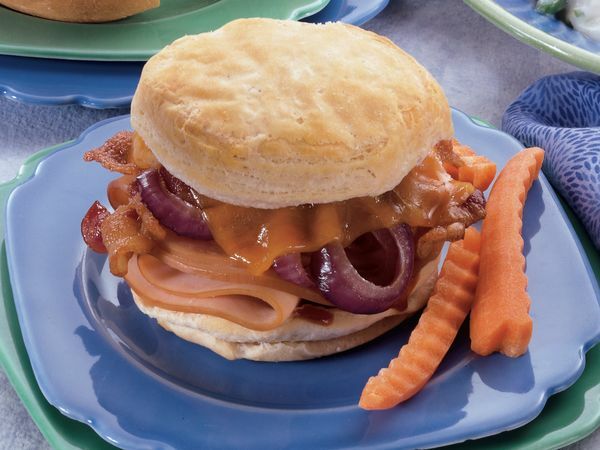 Spread both halves of each biscuit with barbecue sauce. Place halves, side by side, on ungreased cookie sheet. Top each bottom half with turkey, bacon, onion and cheese. Broil 4 to 6 inches from heat for 30 to 60 seconds or until cheese is melted. Place top halves of biscuits over cheese.